Sit back and relax with a small group in the comfort of your mini-coach, as you travel to the amazing Blue Mountains. Your Driver Guide will provide details of the day’s itinerary while you enjoy the journey west. First up is the charming village of Leura. Its one of several villages in the Blue Mountains that perfectly captures the spirit of the region – fresh mountain air and stunning scenery. Its pretty, tree-lined main street is great for browsing through antique shops, art galleries and bookstores – before enjoying complimentary morning tea at one of the cafés. See the imposing Three Sisters, a great photo opportunity. According to Aboriginal legend, this unusual rock formation represents three sisters who were turned to stone. They stand an incredible 922, 918 and 906 metres respectively and are an amazing sight as the sun shifts to cast magnificent colours across the rock face. Located in southern Katoomba, Scenic World provides the ideal location to experience all that the Blue Mountains has to offer. It’s like nowhere else on earth with its 360° views of this incredible landscape. Experience the world’s steepest railway – nothing short of thrilling! 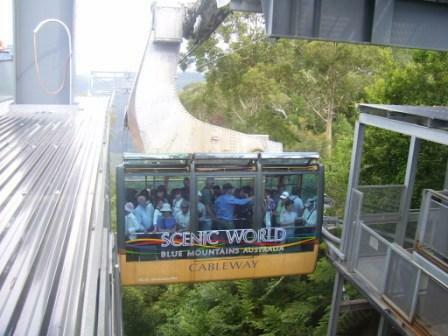 From Scenic World you’ll be treated to a spectacular view. This mountainous World Heritage region covers an area of up to 10,000 square kilometres and features dramatic cliffs, deep canyons and lush vegetation, particularly eucalypt. When first discovered by the European visitors, the Blue Mountains had already been home to the Gundungurra people for what is believed to be millions of years and evidence of their culture and spirituality can be found throughout the region. The Conservation Hut Café is located at the Valley of the Waters in Wentworth Falls. Come and enjoy a hearty lunch on the large open verandah and marvel at the stunning views of the Jamison Valley or in winter inside around the cosy log fire. Embark on a unique journey, discovering over three hundred species of Australia’s diverse wildlife in a natural bush setting, at the award-winning Featherdale Wildlife Park. Hand-feed a kangaroo, wallaby or emu and enjoy a face-to-face encounter with one of the friendly koalas - among one of Australia’s largest private collections of native animals and bird life. You have the option to escape the city traffic on your return to the city. Board your cruise and relax as you make your way down the Parramatta River, admiring waterside suburbs and scenery along the way, passing under the Sydney Harbour Bridge before arriving at Circular Quay, where your Small Group tour concludes. Departs: Pick up starts from 6.50 AM. Group Tour: Please book direct. Please check 'Specials' and receive discounts. A group of 10 or more people are picked up from any Sydney Metro area for a private tour.